Richard Logan came off the bench to help Exeter come from behind to beat Dagenham & Redbridge. Jon Nurse should have given the Daggers the lead but his header was comfortably saved by Ben Hamer. The visitors did go in front when Romain Vincelot tapped in Danny Green's corner from close range. But the lead lasted just five minutes as Matt Taylor nodded an equaliser from David Noble's free-kick and Logan headed home Daniel Nardiello's cross. The Daggers sit one place above the relegation zone, albeit with a game in hand over three of the four sides below them. The win sees Exeter move up to 10th place, eight points off the play-off places. "It was a fantastic game of football that I'm very happy we won. "We knew it would be a tough game, but we just had enough about us in the last 15 minutes to win it. "We take every game on its merits, assume the other side are going to be at their maximum and try to achieve the maximum ourselves and we weren't far from it today." 90:00+3:38 John Akinde gives away a free kick for an unfair challenge on Richard Duffy. Ben Hamer takes the indirect free kick. 90:00+2:43 Free kick awarded for an unfair challenge on Ryan Harley by Peter Gain. Ben Hamer restarts play with the free kick. 90:00+2:43 Booking The referee cautions Peter Gain for unsporting behaviour. 90:00+1:20 Free kick awarded for a foul by John Akinde on Matthew Taylor. Ben Hamer takes the indirect free kick. 90:00+0:55 Jamie Cureton is flagged offside by the assistant referee. Tony Roberts takes the indirect free kick. 88:12 Richard Logan takes a shot. Save made by Tony Roberts. 86:30 Booking Richard Logan receives a caution for unsporting behaviour. 86:26 Assist on the goal came from Daniel Nardiello. 86:26 GOAL - Richard Logan:Exeter 2 - 1 Dag & Red Richard Logan fires in a goal from close in to the top right corner of the goal. Exeter 2-1 Dag & Red. 82:39 Outswinging corner taken right-footed by Danny Green. 81:55 Jake Thomson takes a shot. Save made by Tony Roberts. 80:08 Free kick awarded for a foul by Peter Gain on Richard Duffy. The assist for the goal came from David Noble. 80:08 GOAL - Matthew Taylor:Exeter 1 - 1 Dag & Red Matthew Taylor scores a headed goal from inside the six-yard box. 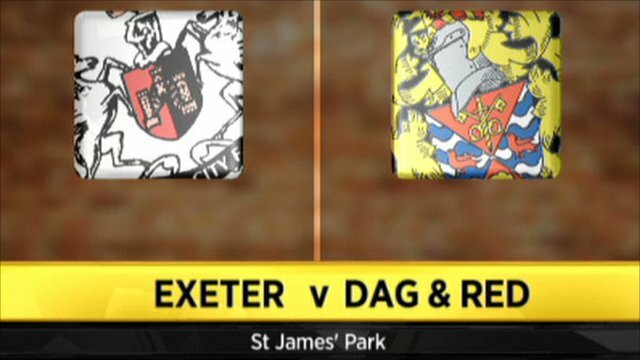 Exeter 1-1 Dag & Red. 79:10 Inswinging corner taken by Ryan Harley from the left by-line, Romain Vincelot makes a clearance. 78:43 Ryan Harley takes a outswinging corner. 77:02 Danny Green takes a inswinging corner. 76:39 Corner taken by Danny Green, clearance made by Matthew Taylor. 75:33 Danny Green takes the outswinging corner, Mark Arber provided the assist for the goal. 75:33 GOAL - Romain Vincelot:Exeter 0 - 1 Dag & Red Romain Vincelot finds the back of the net with a headed goal from close in. Exeter 0-1 Dag & Red. 73:04 Substitution Jake Thomson comes on in place of James Dunne. 71:22 John Akinde produces a lobbed right-footed shot from deep inside the penalty box which goes wide of the right-hand upright. 68:40 Foul by Damien McCrory on Daniel Nardiello, free kick awarded. Ryan Harley shoots direct from the free kick. 66:59 Substitution John Akinde replaces Bas Savage. Correction - 65:14 Danny Green gives away a free kick for an unfair challenge on Scott Golbourne. Direct effort from the free kick comes in from Ryan Harley. 65:14 Danny Green challenges Scott Golbourne unfairly and gives away a free kick. Ryan Harley delivers the ball from the free kick right-footed from left channel. 63:46 Danny Green has an effort at goal from just outside the box which goes wide of the left-hand post. 62:29 Bas Savage takes a shot. Save made by Ben Hamer. 62:12 Abu Ogogo takes a shot. Save by Ben Hamer. 61:46 Corner from the right by-line taken by Danny Green, Ryan Harley manages to make a clearance. 61:07 Richard Logan concedes a free kick for a foul on Scott Doe. Mark Arber restarts play with the free kick. 58:47 Ryan Harley fouled by Romain Vincelot, the ref awards a free kick. Scott Golbourne takes the free kick. 58:47 Substitution Richard Logan joins the action as a substitute, replacing John O'Flynn. 58:47 Substitution Daniel Nardiello on for Billy Jones. 56:18 Corner taken by Danny Green from the right by-line, clearance made by Richard Duffy. 54:44 Ben Hamer fouled by Bas Savage, the ref awards a free kick. Ben Hamer restarts play with the free kick. 54:27 Danny Green takes the inswinging corner, Steve Tully manages to make a clearance. 54:11 Jon Nurse takes a shot. Save made by Ben Hamer. 52:41 Free kick awarded for an unfair challenge on Scott Golbourne by Abu Ogogo. Free kick taken by Ben Hamer. 50:43 Corner taken by Danny Green from the left by-line to the near post, Steve Tully makes a clearance. 49:51 Ryan Harley takes a shot. Save by Tony Roberts. 49:22 Inswinging corner taken from the left by-line by Ryan Harley. Correction - 46:48 Inswinging corner taken by Ryan Harley from the left by-line, Bas Savage makes a clearance. 46:48 Corner from left by-line taken by Ryan Harley. 45:00+2:21 The whistle is blown to end the first half. 42:01 Corner taken by Ryan Harley. 40:30 Unfair challenge on Richard Duffy by Jon Nurse results in a free kick. Ben Hamer takes the free kick. 37:23 David Noble concedes a free kick for a foul on Romain Vincelot. Free kick taken by Danny Green. Correction - 35:50 Inswinging corner taken from the left by-line by Ryan Harley, Headed effort from deep inside the penalty area by Scott Golbourne goes harmlessly over the crossbar. 35:50 Corner taken right-footed by Ryan Harley, Header from deep inside the penalty area by Scott Golbourne goes harmlessly over the crossbar. 33:29 Jon Nurse challenges Matthew Taylor unfairly and gives away a free kick. Billy Jones takes the free kick. 32:53 Bas Savage challenges Richard Duffy unfairly and gives away a free kick. Ben Hamer takes the indirect free kick. 30:47 Free kick awarded for a foul by John O'Flynn on Peter Gain. Direct effort from the free kick comes in from Danny Green, blocked by John O'Flynn. 29:55 Outswinging corner taken from the right by-line by Ryan Harley, clearance by Romain Vincelot. 29:40 Steve Tully takes a shot. Oliver Lee gets a block in. 28:39 Corner taken right-footed by Danny Green, clearance by Matthew Taylor. 28:16 Oliver Lee takes a shot. Blocked by Richard Duffy. 26:35 Corner taken by Danny Green from the right by-line, Jon Nurse takes a shot. Billy Jones manages to make a clearance. 26:08 Corner taken by Danny Green from the left by-line, Billy Jones manages to make a clearance. 23:32 Jamie Cureton has an effort at goal from just inside the box that misses to the right of the target. 22:48 Scott Doe challenges Steve Tully unfairly and gives away a free kick. Richard Duffy crosses the ball in from the free kick, Scott Doe manages to make a clearance. 14:50 Header from deep inside the area by Ryan Harley goes over the bar. 13:15 The assistant referee flags for offside against Jamie Cureton. Tony Roberts restarts play with the free kick. 12:33 Jamie Cureton has a headed effort at goal from deep inside the area missing to the right of the target. 10:23 Jamie Cureton is caught offside. Tony Roberts restarts play with the free kick. 9:44 Foul by Steve Tully on Damien McCrory, free kick awarded. Tony Roberts restarts play with the free kick. 8:28 Jamie Cureton takes a shot. Blocked by Scott Doe. 7:23 Jamie Cureton is flagged offside by the assistant referee. Tony Roberts takes the indirect free kick. 4:51 Free kick awarded for an unfair challenge on Scott Golbourne by Peter Gain. Free kick crossed left-footed by Billy Jones. 0:09 Inswinging corner taken right-footed by Ryan Harley from the left by-line, Romain Vincelot makes a clearance.